“The first moment I knew I wanted to become a chef was when I was watching the show “Great Chefs” on Discovery Channel,” says Brik. Brik’s early interest in the kitchen led to his journey toward professional culinary cooking. He started working the dinner shift at Wolfgang Puck’s Spago, an exclusive restaurant in Beverly Hills. In the late 90’s sushi became the new “thing” and a culinary revolution, with sushi restaurants opening faster than McDonalds. Jumping on the trend while working at Spago, Brik enrolled in the California Sushi Academy and through his relentless dedication and passion for the craft, Brik became the first top non-Asian sushi chef in the world. While earning his degree in culinary arts at the Culinary Institute of America, Brik also relentlessly pursued and won a culinary externship in Reims, France at one of the oldest Michelin three-star restaurants, Chef Gerard Boyer’s Les Crayéres. Chef Brik took form at Les Crayéres. Brik got first-hand experience working with classical French and modern influence cuisines, influences he would end up bringing to some of the top restaurants in the world. After finishing the internship and graduating Culinary Institute of America, Brik left Spago to be a Sous Chef at the prestigious Chi Restaurant at the Hyatt Hotel in West Hollywood. After the Chi Restaurant, he moved to Las Vegas for a few months to work as a sous chef at Bradley Ogden at Caesars Palace. When he moved back to Los Angeles, he became a senior sous chef at Blowfish Sushi, then the head sushi chef at Wolfgang Puck Catering often working with Mr. Puck directly on the Governors Ball at the Oscars. Chef Brik launched his first self-owned restaurant, Hadaka Sushi, in 2007. Located on the Sunset strip in Hollywood, Hadaka Sushi became a go-to for their unique rolls, and creative sushi platters. In fact, many of his family and families’ family started to frequent including several major Russian restaurant owners, who were so impressed by his style, eventually persuaded him to sell Hadaka Sushi move to Russia to bring his inspired blend of cooking to Moscow. That lead to the opening of Kyoto Restaurant, which specialized in Japanese teppanyaki. Chef Brik brought his classically French-taught influence and blended it with Asian influence to create new innovative flavors. Brik redesigned the menu and structure of the restaurant to bring the cuisine from Japanese teppanyaki to Asian fusion. Simultaneously, he also acted a chef consultant to Sochi restaurant, Café of the Theater, helping it refine its cuisine. 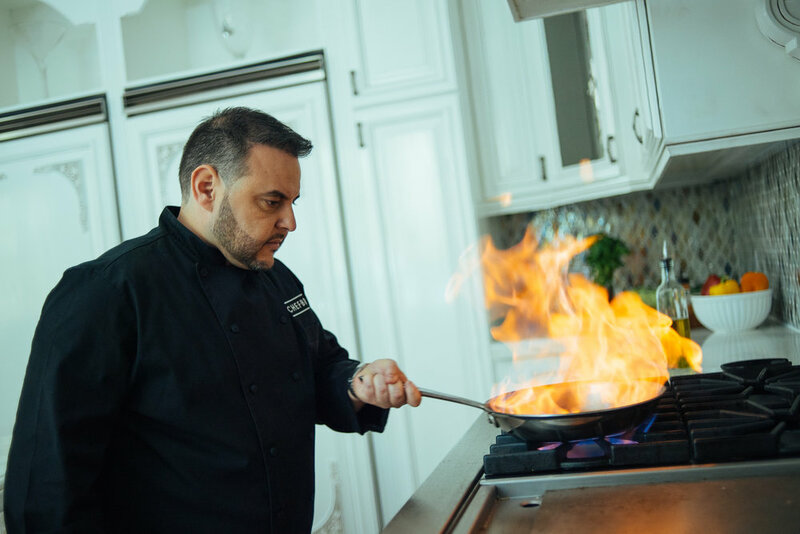 Chef Brik currently resides in Los Angeles working as a private chef running a high-end catering company, and hosting food content on his social channels, but frequently travels to New York for food presentations and TV appearances.